Strengthening Your Child's R.Q. As parents and educators we seek to help our children develop socially in healthy ways. The R.Q. is the "Relational Quotient" of a person; revealing how well they relate to extra-grace- needed people. 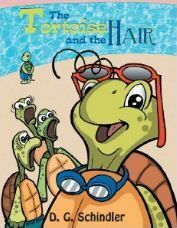 "The Tortoise and the Hair" is a parable of what a healthy R.Q. might look like. The story of Tully the Tortoise is fun to read and naturally leads into a discussion of how to be socially attune to children that are different, and how to reach out to them. "Your best friend may be the turtle next door. Bible truth in modern fable." --Leith Anderson, President, National Association of Evangelicals, Washington, DC "Communications between children and adults require patience, care and skill and aids to this noble and necessary aspect of life are more than welcome. In this regard we warmly recommend Dietrich Schindler's colorful, charming and creative book." --Stuart and Jill Briscoe, authors.